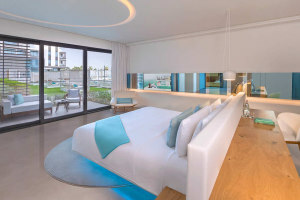 Nestled on the shore of Arabian Gulf with encompassing beach views on the front, Nikki Beach Resort is a heavenly delight for travelers in Dubai. With splendid suites and villas all accomplished in an elegant, minimalistic design, the resort offers its guest the sense of sheer pleasure and comfort. 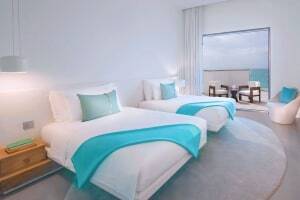 Elated with picture-perfect Gulf as well as Dubai skyline views, the resort also offers various fine dining and casual hangout places, a relaxing beach club by the main pool, a retreating spa and fitness center to make sure you have a fabulous vacation at Dubai. 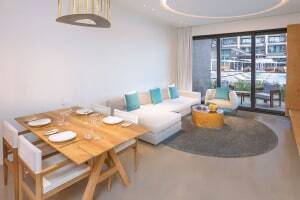 Mod and stylish accommodations facing the Arabian Gulf. Located on the shore of Arabian Gulf, Nikki Beach is blessed with warm sunshine, fine sand and marvelous views. Enjoy your stay here with its fantastic Beach Club surrounding the leisure pool with cozy sun recliners and loungers with gazebos. Rejoice the soothing heat while sipping on some enticing drinks and globally inspired delicacies and light snacks. Kindly carry a towel, sunhat, sunglasses and sunscreen for sun protection. Welcome to Cafè Nikki, an urban bistro that serves some of the most delicious cuisines and dishes. Inspired by places around the world, the Cafeè uses fresh ingredients to prepare global cuisines. It has its stone hearth oven that offers lip-smacking food throughout the day. Tantalize your taste buds with a fantastic Saint Tropez Brunch at the cafè every Friday and spend a lovely time in Dubai. The Saint Tropex Brunch is held from 1:00 PM to 4:00 PM every Friday. Vibrant and airy, the Key West brings you the combination of the Caribbean and Latin-inspired cuisine. Savor some of the classic tacos, mojitos and spicy seafood and enjoy a lazy afternoon in this bright and energetic restaurant. Along with mouth-watering food, Key West is also an excellent place for casual hangout and if you want to go out with friends for a few drinks. The dinner at Key West restaurant starts from 7:00 PM in the evening. Relish the breathtaking views of the Arabian Gulf and the Dubai skyline that from Nikki Beach resort's main pool. Close to the swathing beach and palm trees, the 27- meter pool and the bubble pool has recliners so that guests can soak in the warmth and spend a relaxing vacation in Dubai. The beach area is accessible from 8:00 AM till sunset. 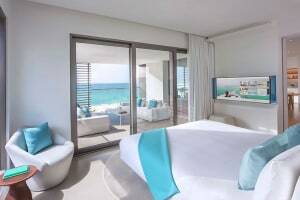 Bathe in the ocean of tranquility and calm at Nikki Beach's Spa that offers exclusive spa suites for both men and women as well as for couples. With a number of massages, facials, body treatments, the spa brings to the complete sense of relaxation and rejuvenation. Loosen up and enjoy traditional Turkish scrubs and foam massages, Moroccan baths, and hammams that brings utter peace to you. There is also a dedication section for Tone gym which is equipped with modern accessories and workout amenities. The gym has professional trainers to assist you and help you on your journey of fitness. The maximum number of extra beds that can be accommodated in a room is one. Up to two children under 12 years of age stay free of cost while using existing bedding. Hotels in Dubai follow a refundable deposit policy which varies from every hotel and would be collected at the time of check-in. We would request you to check for the same at the time of check-in with the hotel staff. Please note that there is a mandatory 20 AED tourism fee per bedroom per unit per night payable directly to the hotel.